Exactly one week ago, Sloan was baptized. If you read my blog preceding last Sunday, you knew I was greatly anticipating this big day in Sloan’s life. I promised I would shed some light on this happy and holy occasion so today I will say a few words about the baptism. 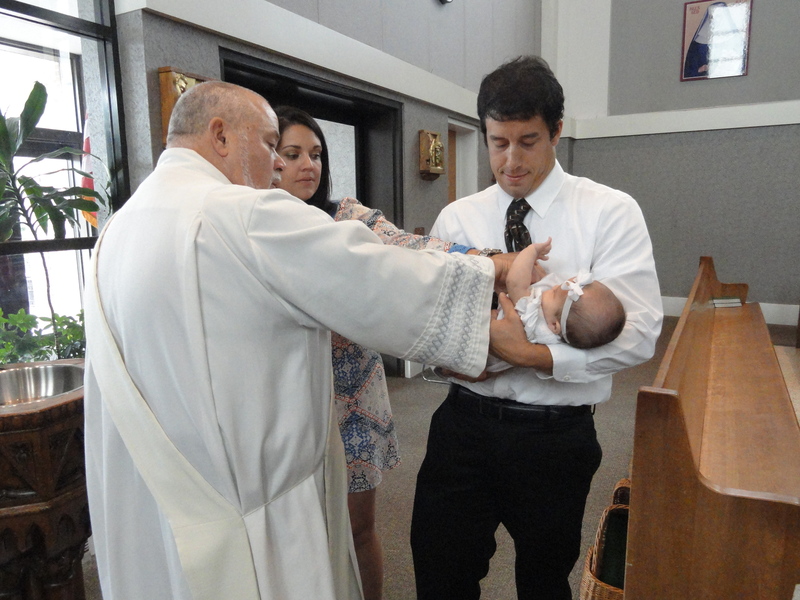 One week ago today, Sloan was baptized at St. Andrew Catholic Church in Myrtle Beach. About a month and a half before Sloan was baptized, I went into the parish office of St. Andrew Catholic Church and met with the pastoral associate. He went over the meaning, significance, and logistics of baptism with me. I filled out some paperwork and we set a tentative date for Sloan to be baptized. That date, June 25, 2017, would be finalized once I had Sloan’s Godparents fill out some paperwork as well. The Godmother, Stephanie (Sidney’s sister), and the Godfather, Glen (my brother), wasted no time getting it done. Sidney brought the documents back to the parish office and the date was set! 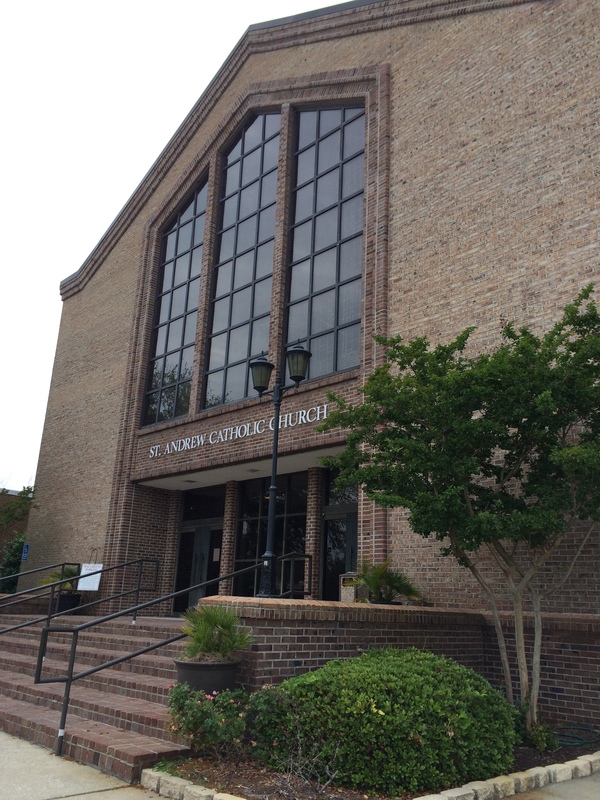 This is the outside of St. Andrew Church in Myrtle Beach, the place where Sloan was baptized. Two days before June 25, we went gown shopping. My mom, Sidney, Glen, Sloan, and myself went to a children’s store in Myrtle Beach and picked out a beautiful gown for our daughter to wear. Obviously I don’t get that excited going out to look at clothes but this was kind of fun. 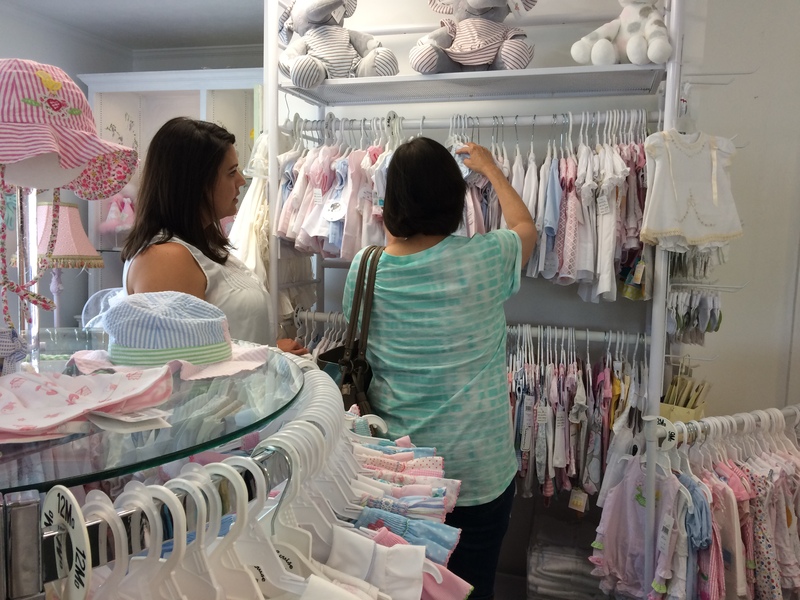 My mom and Sidney looking at baptism gowns. 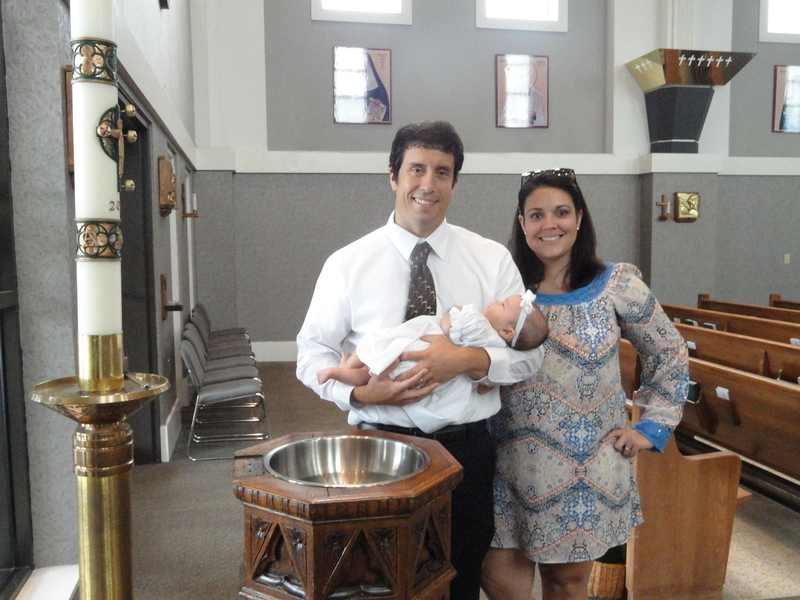 On the day of her baptism, Sloan’s ceremony took place at 1 p.m. The same crew that went dress shopping showed up at the church at 12:40 p.m. The celebrant, Deacon Robert Jones, was waiting for us when we walked through the doors. It was this man who would give Sloan the sacrament of baptism. Although I had listened to Deacon Jones at mass numerous times, I had never personally met him. We chatted and then he went to put on his vestment. 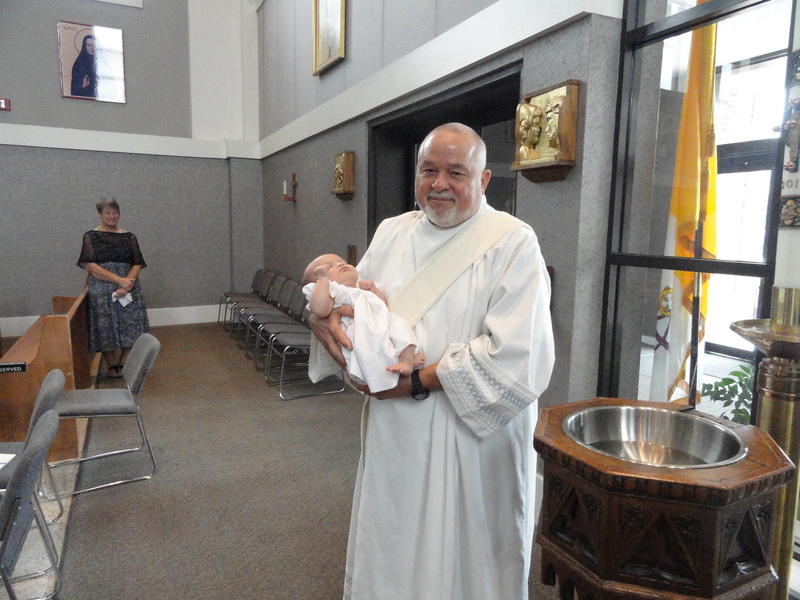 Deacon Robert Jones was the man who baptized Sloan. Shortly thereafter, Steph and her family showed up. They were followed by Sid’s parents. Also attending the ceremony was Sidney’s teaching partner, Melissa, and our friends, Kathy and Tim McCormick. With 1 p.m. approaching, we had a nice little group ready to take part in the holy sacrament. Russell and Harrison attended the baptism and helped answer questions asked by Deacon Jones. The ceremony then started. Deacon Jones asked Sidney and I the name of our child followed by what we were asking for her. He then asked Steph and Glen if they would be willing to help Sid and I with our duty as Christian parents. The deacon then welcomed Sloan into the church. Then, in a moving display, Deacon Jones welcomed everyone gathered to come up and trace the sign of the cross on Sloan’s forehead. As I held her in my arms, our family and friends came up and blessed Sloan. 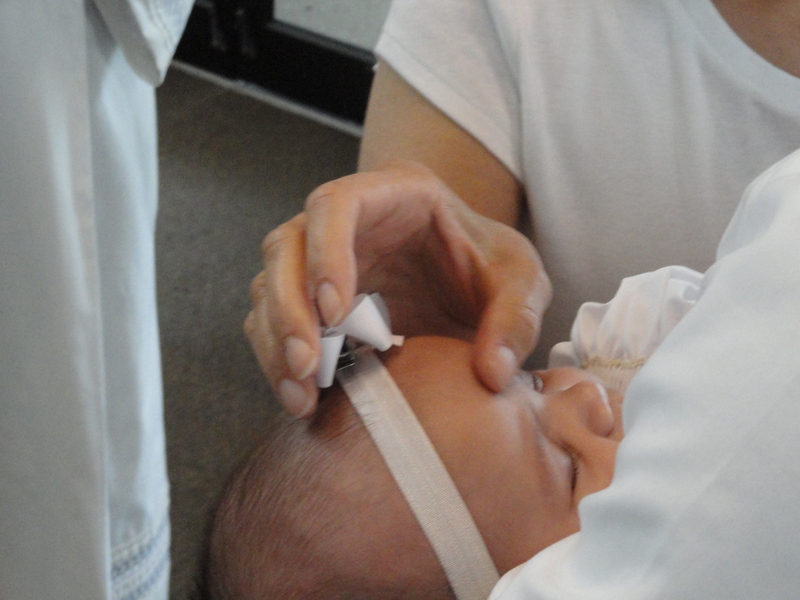 Everyone was invited to come up to the baptismal font and trace the Sign of the Cross on Sloan’s forehead. Deacon Jones then anointed Sloan with the Holy Oil of Catechumens. This is a good time to point out that Sloan, looking as beautiful as an angel, was peaceful the entire ceremony. She was half awake for the duration of it and was nothing but sweet from the start to the finish. I say this because the oil was the first time Sloan could have “objected.” You see, the oil was placed on her breast so Sidney had to pull up her long gown (I was holding Sloan in my arms) so Deacon Jones could apply it. She didn’t make a peep. Deacon Jones blessing Sloan with the oil. It was now time for the main event. Deacon Jones asked all of us gathered some basic tenets of the faith. 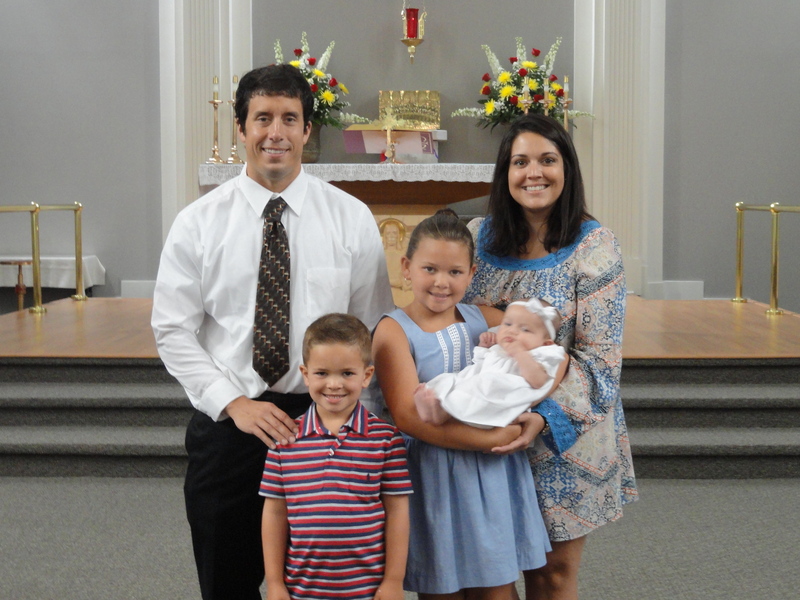 After we accepted, he specifically asked the parents and godparents whether it was our will that Sloan be baptized in the faith of the church. Once we all answered to the affirmative, the water flowed. 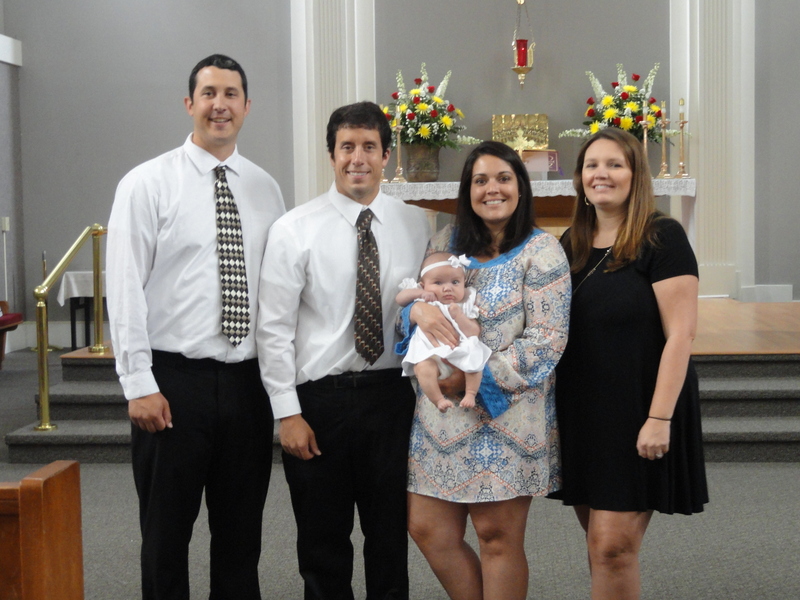 The parents and Godparents played a big part in Sloan’s baptism. “I baptize you in the name of the Father, and of the Son, and of the Holy Spirit,” Deacon Jones proclaimed as he poured holy water on Sloan’s precious head three different times. Deacon Robert Jones baptizing Sloan. After an initial wave of shock, Sloan calmed right down. The first time the water touched Sloan’s head she tensed up right away and let out a little noise. However, right after the initial shock wore off, she was right back to being a peaceful little girl. Her baptismal candle was lit and a blessing was said. Our small group started to clap and a couple of tears streamed down the cheek of Sloan’s proud daddy. Cleansed from original sin and baptized just the way Jesus commanded, it was a very joyful moment. 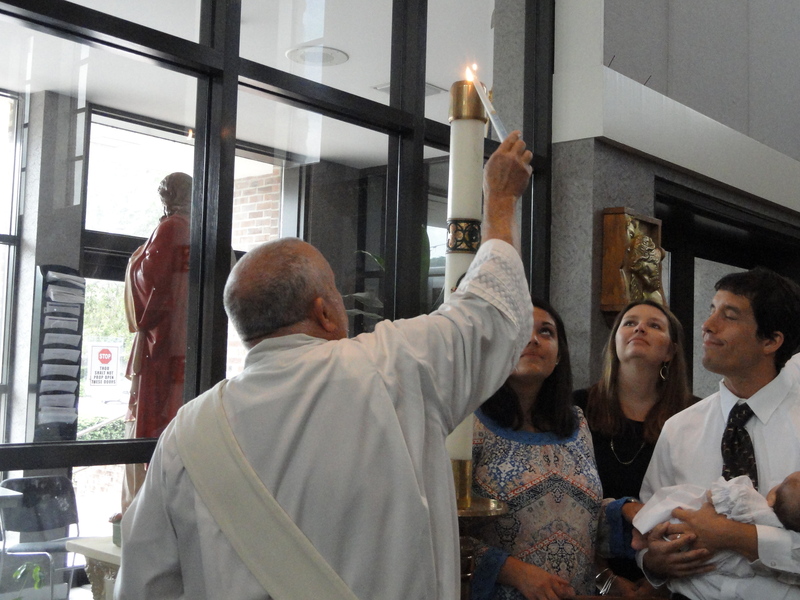 Deacon Jones lighting the baptism candle. With the ceremony concluded, we all took photos. We thanked Deacon Jones for not just doing a good job with the structure of the ceremony itself but for more importantly administering the holy sacrament to Sloan. When the last photo was taken, we exited the church absolutely elated. Our girl is now baptized and salvation has been given to her. Alleluia, Alleluia. Don’t Blink. * If you are Catholic, you have probably witnessed numerous baptisms during the course of an actual mass. 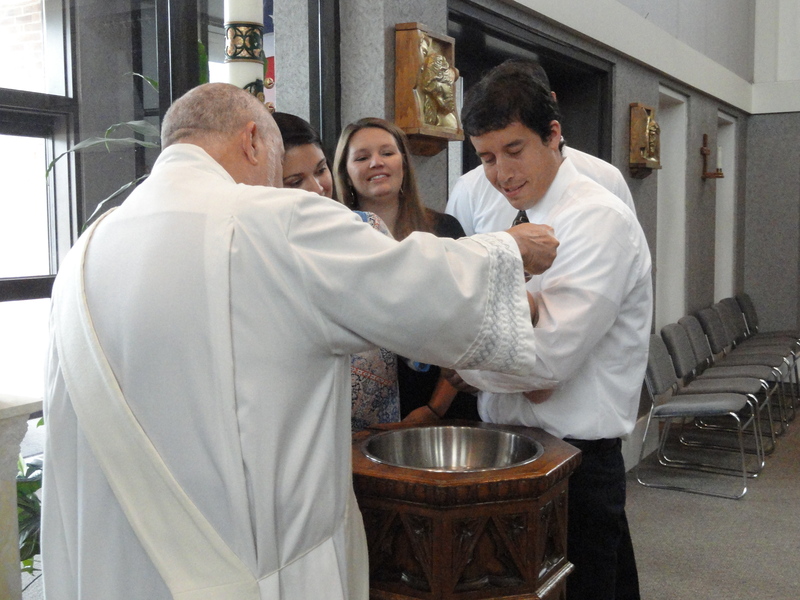 I attended one parish where it seemed like there was a baptism at mass every week! Although this is the preferred method for many of the faith, I had always wanted a more intimate and personal ceremony away from the stresses and unpredictability of a regular service in front of the congregation. As a parishioner of St. Andrew, I never needed to worry about this because it is parish policy that all baptisms occur outside of mass.